Rat C-peptide and Proinsulin: diagnostic markers for diabetes and hypoglycemia - Advanced ImmunoChemical Inc.Advanced ImmunoChemical Inc.
Advanced ImmunoChemical offers monoclonal antibodies specific to different parts of rat C-peptides I and II. 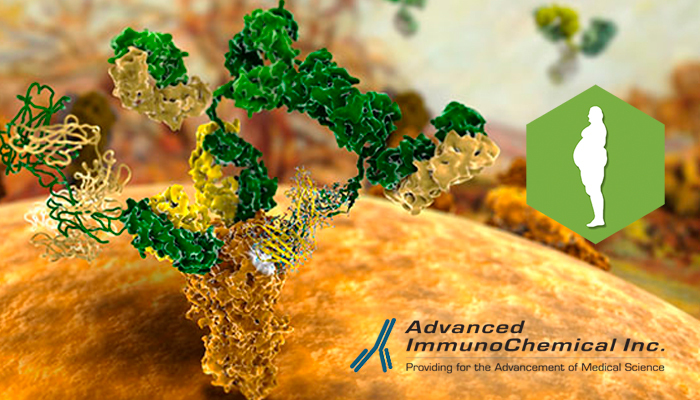 Thoroughly chosen epitopes and original approaches for selecting specific monoclonal antibodies have produced highly sensitive and specific antibodies which make C-peptide detection possible without cross-reactivity with native proinsulin or other known forms of partially processed proinsulin. Moreover we also offer pairs of antibodies that are able to detect either both isoforms of rat C-peptide (C-peptides I and II) or one of two isoforms (C-peptide I or II). We also offer monoclonal antibodies that specifically detect intact and partially processed proinsulin and do not interact with free C-peptide. Rat C-peptide is a polypeptide molecule comprising 31 amino acid residues with molecular mass of about 3.2 kDa. C-peptide is originated from proinsulin, which is synthesized in the beta-cells of the Islets of Langerhans and cleaved enzymatically releasing insulin and C-peptide. Scheme of proinsulin processing is represented on Fig. 1. Proinsulin is cleaved by two Ca-dependent endopeptidases (prohormone convertases) PC2 and PC3. Endopeptidase PC2 (type II) cleaves at the A/C chain junction of proinsulin (between amino acid residues 65 and 66) and PC3 (type I) cleaves at the B/C junction (between amino acid residues 32 and 33)(1). Carboxypeptidase H removes basic amino acids from the C-terminus of proinsulin-derived peptides to generate insulin and C-peptide (2). In contrast to PC3 that recognizes des-64,65 proinsulin and intact proinsulin as similar substrates, PC2 has a stronger preference for des-31,32 proinsulin compared to intact proinsulin. This mechanism provides the preferential route of proinsulin conversion via des-31,32-proinsulin (type I processing) (Fig. 1: Ia and Ib)(3). Des- rather than split- forms prevail in the blood and the major circulating form of partially processed proinsulin is des-31,32 proinsulin (Fig. 1: Ib). The term “proinsulin” refers to non-processed or “intact proinsulin” whereas term “partially processed proinsulin” is used for split- and des- forms of proinsulin molecule (Fig. 1: Ia, Ib, IIa and IIb). Insulin, one of the two products of proinsulin processing, regulates carbohydrate metabolism. Insulin has a highly conservative sequence over mammals, reptiles, birds and fish. On the contrary, C-peptide (physiological activity was not shown) demonstrates considerable interspecies variability. For the most of species only one form of proinsulin is described. Unlike others, rats and mice produce two proinsulin isoforms – I and II, which differ from each other in two (rat) or three (mouse) amino acid residues of the C-peptide part of proinsulin. Analysis of proinsulin synthesis and processing, insulin and C-peptide clearance are very important for better understanding of carbohydrate metabolism abnormalities. Assays for insulin, proinsulin and C-peptide are widely used for monitoring of hypoglycemia, pathogenesis and treatment of diabetes mellitus. It was demonstrated that C-peptide measurements in blood or urine have several advantages over the direct insulin quantification. C-peptide measurements could be the only method to determine insulin production in case of diabetes treatment when endogenous insulin is mixed in blood with the exogenous molecule. Being released into the bloodstream insulin is utilized very fast by liver. Fast excretion and fast elimination results in considerable fluctuations of insulin concentrations in the blood. C-peptide is eliminated and degraded mainly by kidneys and this process is not so impetuous as insulin elimination. Also insulin in blood is less stable than C-peptide. As a result, the half life of insulin in blood is significantly shorter (4 min) than that of C-peptide (33 min)(4). Finally, hemolysis is known to reduce significantly measured insulin concentration(5). Consequently C-peptide seems to be more reliable indicator of insulin production than insulin by itself. Search Rat C-peptide and proinsulin references from PubMed.